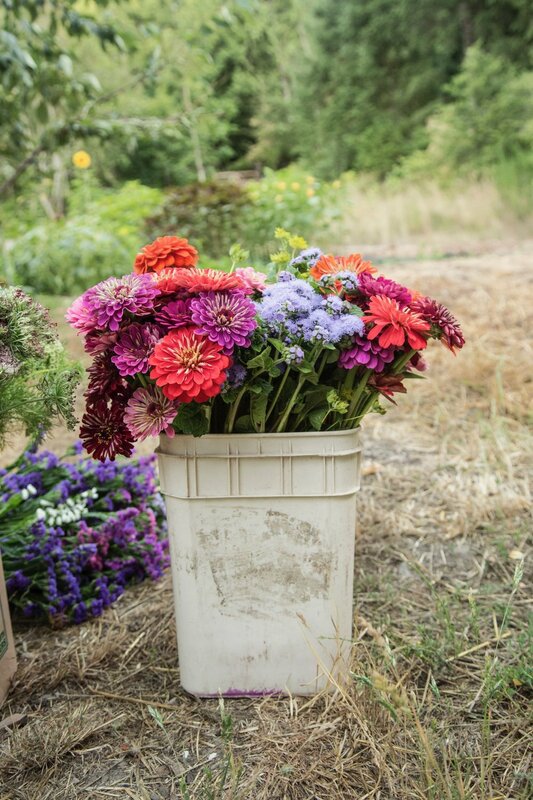 Flowers are essential for us; as part of our crop plan, to attract pollinators and deter pests, to add beauty to special events, and as a reminder that organic goes beyond food. There is nothing quite like having a cut flower garden. We love it! Local, organic flowers are the next big wave in organic agriculture and the champions of this movement are the florists who recognize the beauty and integrity of local flowers and are willing to get creative with colour, style, and availability. There is also a growing awareness that, despite the fact that flowers are not usually ingested, organic practices are still very relevant for flower growing. We must take care of the land where flowers are grown and the people who handle this special product. Our flowers are fair and organic and for a moment they bring the flower fields inside to the table. Our hand-tied seasonal bouquets and bunches are available at the Earth Candy Farm Market, located on our farm, open Tuesdays and Saturdays from 9am - 5pm. Contact info here.